The struggle was very real when I was searching high and low for the perfect dress for our gorgeous friend's fall wedding. I said to Robert it would be so much easier if I could just wear a suit and then it occurred to me, why the hell couldn't I? 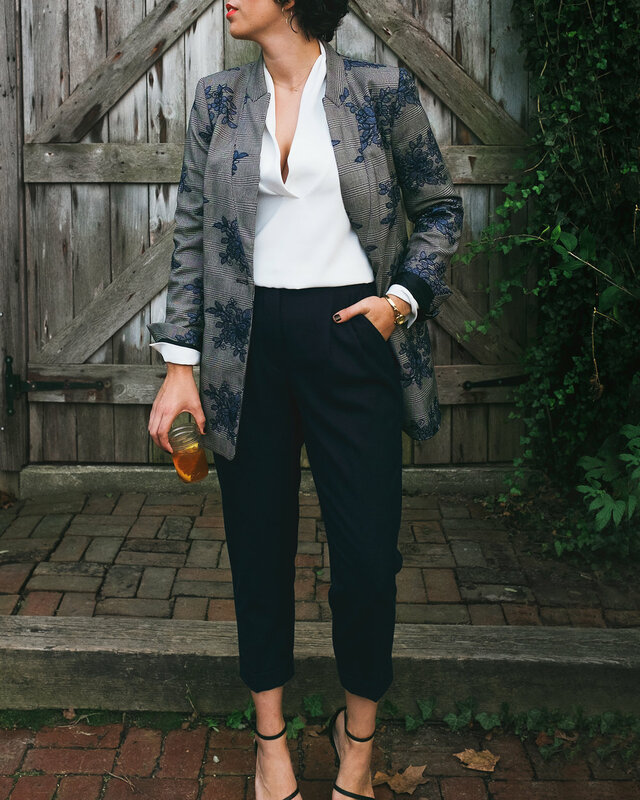 Thus began my search for the perfect suit (I guess technically this trouser + blazer pairing is not a traditional suit but it's the next best thing) and while it was more difficult than I thought it would be, it was worth the challenge of finding something that was formal enough, feminine feeling enough, and seasonally appropriate. I started out with a tight fitted all red ensemble that seemed fine at the time, but suddenly it appeared like I was dressing up as Cruella de Vil for Halloween. Not a good look. It was back to the drawing board after that, but once I found this blazer, the rest of the outfit followed suit (pun intended). Having a low cut top helped balance the masculine with the feminine, while the cropped + cuffed trouser gives it that tomboy feeling, and helps it all to feel less office, more party. Shop some mix + match suit ideas below for your next cold weather event.